The Pathfinder Society is an eccentric organization of adventurers, explorers, and scholars with agents spread across Golarion and beyond. While members are expected to be fairly self-sufficient, the organization's leadership knows that those equipped with the knowledge and gear to face the challenges of the job are most likely to survive to bring back priceless treasures and to fill the Pathfinder Chronicles with tales of their daring exploits. 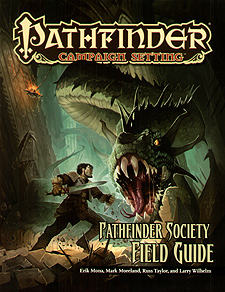 The Pathfinder Society Field Guide breaks down what it means to be a Pathfinder and gives players and GMs tools to build characters and campaigns around the illustrious organization. In addition, all content within this book is 100% legal for use in the world-spanning Pathfinder Society Organized Play campaign. An overview of Absalom, City at the Centre of the World, where the Pathfinder Society keeps its headquarters. Details on 10 factions within the Pathfinder Society, and the benefits available to those agents loyal to each. New archetypes for Pathfinders of all three branches of the organization: the Scrolls, the Spells, and the Swords. A complete field guide covering threats to Pathfinder agents, as well as suggestions on building PCs prepared to face them. Rules for day jobs and professions, property, followers, and other ways to customize your character. A system for turning characters' fame and prestige into valuable in-game rewards.